For such a little person, a baby sure goes through a lot of laundry: diapers, bibs, sleepers, undershirts, blankets, sheets, socks, pants . . . and of course all the items the baby spits up on that also need to be cleaned—often. That’s why having a baby in the house turns the mundane washer and dryer into wonder machines of incredible convenience. This increase in laundry loads is also a good reason for you to focus your green efforts on the laundry room. If you’re buying a new washer, remember to look for Energy Star models. Traditional top-loading washing machines use about forty gallons of water per load, whereas Energy Star washers use only about twenty-five gallons per load. That’s a 40 percent savings in water, which translates into an energy cost savings of almost 50 percent.10 Make that new machine a front-loader. Front-loading machines work on a horizontal axis that saves both water and energy. A top-loading machine must be filled with water in order to keep the clothing wet and then an agitator swirls the water around, but a front-loading machine uses less water because the tub does not need to be filled completely; the tub itself rotates, making the clothes tumble in the water. These machines also reduce the energy needed for drying clothes because they spin clothes faster than top-loading machines, which reduces the moisture level before the clothes even enter the dryer. As an extra green bonus, front-loading washers are kinder to your clothing, so your clothes last longer. In comparison to top-loading washing machines, the front-loaders use 50 percent less energy and a third less water. With those savings, it will pay for itself in six years and should last for ten. In addition, a front-loading Energy Star washer will save enough energy annually to light your entire home for a month and a half, and it saves as much water in a year as the average person drinks in a lifetime. While you’re looking for ways to go green in the laundry room, don’t overlook your detergent. You’ll find that it’s easy to make the switch to green detergents that are plant based (corn, palm kernel, or coconut oil) and to non-chlorine-bleach products made from sodium percarbonate or sodium perborate. For those laundry tasks that require special attention, think simple and homemade. For stains, try soaking fabrics in water mixed with one of the following: Borax, lemon juice, hydrogen peroxide, or white vinegar. For fabric softening, add a quarter cup of baking soda to the wash cycle. For static cling, add a quarter cup of white vinegar to the wash water. To soften water, use a soap-based, rather than detergent-based, cleaner. Buy laundry products in containers that are recyclable. There are very good reasons for making the switch to a green product. Most conventional laundry detergents are made from petroleum— a nonrenewable resource. They don’t readily biodegrade, and they threaten wildlife after they go down the drain. Many also contain chemical fragrances and phosphates (which build up in streams and lakes, upset the natural balance, and starve fish of the oxygen they need to survive). They also contain chemicals linked to cancer and reproductive problems. That’s just plain bad for the earth and for your family. Chlorine bleach should also be banned from your laundry room. This popular whitener and disinfectant is highly caustic; when it goes from your drain into the natural world, it can create organochlorines, which are suspected carcinogens as well as reproductive, neurological, and immune system toxins. They also damage the earth’s ozone layer. When you have several loads to wash, do them back-to-back so you can use the residual heat in the dryer. Run the washing machine only when you have a full load. Wash with cold water to save 80 to 90 percent of the energy costs of washing. To prevent static cling, add one cup white vinegar to the rinse cycle, using your washing machine’s dispenser. Static cling, by the way, is caused by using synthetic fabrics, so you could also switch to cotton. The vinegar also kills bacteria and prevents the buildup of detergent residue. Remove the laundry before it’s overdried. Clean out the dryer’s lint trap after every load to improve circulation and reduce energy use. 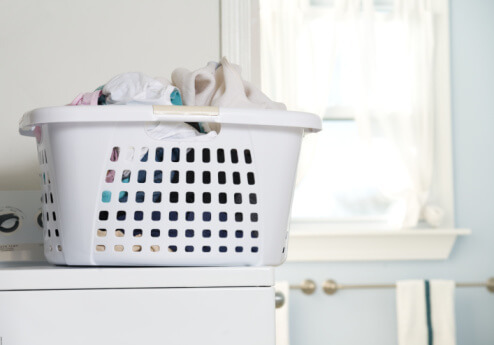 Remove clothing from the dryer before the cycle ends and line dry to finish. This conserves energy and increases the life span of the clothing. Avoid using dryer sheets to soften fabrics. They often contain harsh chemicals that can irritate sensitive skin. Soften fabric with baking soda in the wash cycle. Try a commercial green fabric softener like Natural Choices Home Safe Products’ Safe ‘n Soft, Ecover’s Natural Fabric Softener, or Sun & Earth’s Ultra Fabric Softener.